Psychologists will have a two-year reprieve from reporting quality measures for Medicare patients beginning January 2017, according to the Center for Medicare and Medicaid Services (CMS). The Physician Quality Reporting System (PQRS) that began in 2007 is being phased out in December. Although that may be a relief to those who opposed it, psychologists will also not be eligible to receive bonuses under the new system until 2021. The Medicare Access and CHIP Reauthorization Act of 2015 (MACRA), legislation that passed with bi-partisan support, repeals the SGR formula that calculated payment cuts for all providers. MACRA creates a new framework for rewarding clinicians for providing higher quality care by establishing two tracks for payment, Merit-based Incentive Payment System (MIPS) and Alternative Payment Models (APMs). According to Slavitt, CMS released a proposed rule about the new quality performance system that is based on three principles: making the work for providers more patient-centric to support patient needs and coordinate services; more practice driven, allowing providers to select measures most appropriate for their population, and simpler to reduce duplication. The Merit-based Incentive Payment System (MIPS) consolidates three existing quality reporting programs: PQRS, the Value-Based Payment Modifier (VBPM) and meaningful use (MU). The system also adds a new program, clinical practice improvement activities (CPIA). MIPS is designed to change the payment structure away from volume to value as Medicare moves away from traditional fee-for-service. 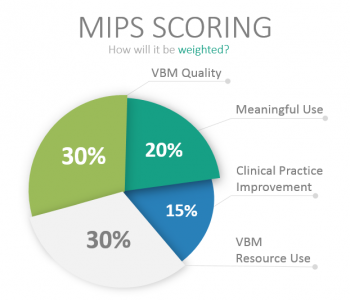 The four components of MIPS will determine an overall composite performance score from 1 to 100, with differing weights assigned to the factors. The components are quality (worth 50 percent), resource use (10 percent), clinical practice improvement activities (15 percent) and advancing care information (25 percent). MIPS will impact reimbursement by assessing providers on each of the categories and assigning an overall score. Physicians whose scores fall below a predetermined threshold will receive a penalty up to 4 percent and those with scores above the threshold will be awarded a bonus up to 9 percent in 2019 based on their performance in 2017. Psychologists can begin to participate in 2019. Exemptions from MIPS include clinicians in their first year of billing Medicare and providers whose volume of Medicare payments is less than $10,000 in claims per year and provide services to 100 or fewer Medicare patients. The bonuses may go up to 12 percent if large numbers of providers are penalized, according to CMS. Because the adjustments and bonuses are made in a budget neutral manner the money for the bonuses comes from those who are penalized. Specific requirements for psychologists and other non-physician groups have yet to be determined. CMS encouraged psychologists to volunteer to participate in 2017 to get a head start on what will be required in the future. The official comment period about the MIPS proposed rule ended June 27. “Psychologists should understand that if they do not report any measures under MIPS, once they become eligible they will end up with a very low composite score and should expect to see significant reductions in their Medicare payments,” according to an Information Alert from Doug Walter, associate executive director for Government Relations for the APA’s Practice Organization. Read more in Therapy Tidbits – July/August 2016, a 1-hour online continuing education (CE) course that discusses a variety of psychotherapy topics. This entry was posted in Mental Health, Psychology CE and tagged American Psychological Association, APA, CE, Center for Medicare and Medicaid Services, CMS, continuing education, Medicare, Merit-based Incentive Payment System, MIPS, Online Courses, PQRS, Professional Development Resources by Gina Gunderson. Bookmark the permalink.